Performers include: Khandi Alexander, Rob Brown, Kim Dickens, India Ennenga, John Goodman, Michiel Huisman, Melissa Leo, Lucia Micarelli, David Morse, Clarke Peters, Wendell Pierce, Jon Seda, and Steve Zahn. Created by David Simon (The Wire) and Eric Overmyer (Homicide: Life on the Street and Law & Order), this TV series is set in New Orleans. It chronicles the struggles of a diverse group of residents — including musicians, chefs, Mardi Gras Indians, and other New Orleanians — as they rebuild their lives and their city. The story begins in fall 2005, three months after Hurricane Katrina and the massive engineering failure in which flood control failed throughout New Orleans, flooding 80% of the city and displacing hundreds of thousands of residents. Fictional events depicted in the series take place along the actual chronology of political, economic, and cultural events that followed the storm. 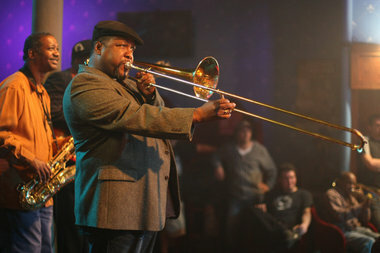 Characters include: struggling trombonist Antoine Batiste (Wendell Pierce); tavern owner LaDonna Batiste-Williams (Khandi Alexander); civil rights attorney Antoinette “Toni” Bernette (Melissa Leo); Tulane University teacher and author Creighton Bernette (John Goodman); Toni and Creighton’s teenage daughter, Sofia Bernette (India Ennenga); struggling chef Janette Desautel (Kim Dickens); Mardi Gras Indian chief Albert “Big Chief” Lambreaux (Clarke Peters); Albert’s accomplished trumpet player son, Delmond (Rob Brown); part-time DJ and musician Davis McAlary (Steve Zahn); classically trained street-violinist Annie Talarico (Lucia Micarelli); street musician Sonny (Michiel Huisman); honest cop Terry Colson (David Morse); and Nelson Hidalgo (Jon Seda), a politically connected developer and venture capitalist from Dallas. ‘Treme,’ pronounced Truh-may, takes its title from the name of one of the city’s oldest neighborhoods, a historically important source of African-American music and culture. Davis gets a “job, job”; Colson gets his transfer too little too late. Batiste runs into a couple of old Mardi Gras friends; LaDonna and the boys do Mardi Gras day; Bernette and Sofia salute Creighton and carry out their Mardi Gras tradition; LP Everett experiences his second Mardi Gras in a row. Annie butts heads with Marvin Frey in the studio. Hidalgo cashes out — but pays it forward.